Click to get the entire program right now, if you like it we could activate it over the phone and you could be processing deals today! This DEMO installs the entire program to your PC, you can use all features except changing the customer last name. This Demo will let you print forms and use the features. If it ask's you for a random password call 800 701-6686 (24/7) or click here We will send you the password by e-mail instantly. SAVE TO YOUR DESKTOP BEFORE YOU RUN IT Note: You may need to select "Run Anyway", "Other Options", and "More Actions or options" as your system wants you to be sure you wish to install the Demo. You don't have to install the program, we can set it up for you remotely and stay with you on the phone and your screen while you learn to use it. This program is guaranteed not to contain any type of virus, malaware or trojan, our offices and servers are all located in the USA. This program complies with Federal Regulations Z and Reg M of the Truth in Lending Act. and all Motor Vehicle Departments. If it ask's for a password call 800 701-6686 or 818 5910631 for the latest password or click here We will send you the password by e-mail in two seconds. 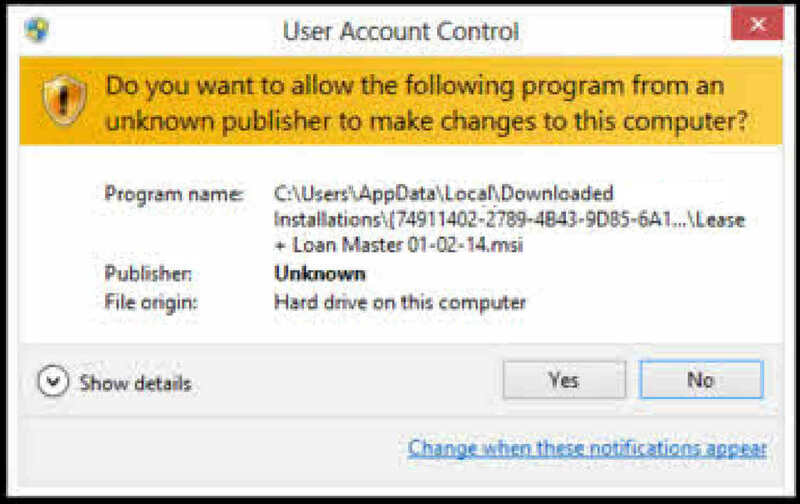 Some Antivirus and protection programs ask that you insist with the installation, showing them as "Other Actions" and "Install Anyway" After installation our program may be uninstalled completely. You may also see anti-virus warnings like the one above, you can select Run, or More Options and then Run Anyway. Other times you may see the warning below and you can select Yes. © Copyright 2012 leasemaster.com. All rights reserved.